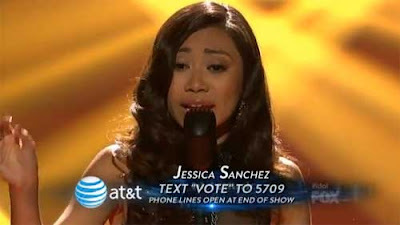 Jessica Sanchez on "Everybody Has A Dream"
Home » American Idol » Entertainment » World » Jessica Sanchez on "Everybody Has A Dream"
The Filipina-Mexican American Idol finalist has finally makes herself to the top list again after her last Wednesday performance with the song choice of "Everybody Has A Dream." Her stunning performance put her slot on the top. Last week, even she didn't make the AI judges empress, she still earned back the third standing ovation for the third time around as she sang "Everybody Has A Dream." The first standing ovation she get was in her performances of Whitney Houston songs "I Will Always Love You," then second is the Jennifer Hudson's "Love You I Do." This coming Friday morning (Local Time) American Idol announced that the contestant with the lowest votes will be booted off the competition. Meanwhile, watch Jessica Sanchez performance as she sing the song "Everybody Has A Dream"
Comments or suggestions about "Jessica Sanchez on "Everybody Has A Dream"" is important to us, you may share it by using the comment box below.